A Freedom Summer meeting targeting youth was held this past summer to focus attention on voting rights, quality education, and other issues impacting blacks in the South. Civil rights veterans and a new generation of young people are trying to apply the 50-year-old lessons of Freedom Summer to current issues in a conference at Tougaloo College. The conference was held for four days. Besides commemorating the historic events of 1964, the conference sought to focus fresh attention on voting rights, education, health care and workers' rights among African Americans and in the South. "We are at this conference to strategize. How do we open up democracy and ensure the barriers of the past do not recur?" said Derrick Johnson, president of the Mississippi NAACP and a co-chair of the Freedom 50 event. "This is a conference not only to remember and celebrate but also to re-energize." 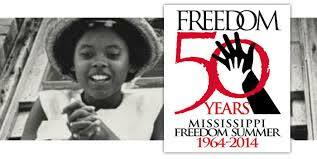 Freedom Summer meeting targets youth. 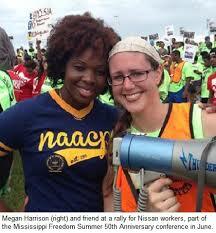 Conference organizers, for example, planned a march on the Nissan Motor Co. plant in Canton to support efforts by some workers to form a labor union there. Johnson also cited his ongoing fight against requirements that Mississippi voters show photo identification at the polls. "Fifty years later, almost 1,000 kids are here again to do the work necessary," said Albert Sykes, organizer of the event's youth congress. "This experience is an opportunity for youth and civil rights veterans to be able to sit down together." Sykes said one example of youth activism today is an ongoing petition drive to put a state constitutional amendment on the ballot to require Mississippi to fully pay for its public-school funding formula. The original Freedom Summer saw more than 1,000 mostly white volunteers come to Mississippi to work with black Mississippians in an effort to register more black voters. Hollis Watkins, one of the organizers of the effort 50 years ago, said it shone a light on the violence that underlay segregation and helped end black fear in Mississippi. "This is what Freedom Summer was about, to help break Mississippi out of the jail of itself so the rest of the world could participate in the process," he said.